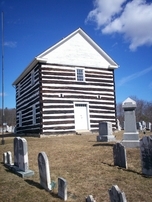 The Old Log Church was the first church built by the early settlers of the area. It was built on land donated by John Schell, the founder of the village of Schellsburg. John Schell arrived in this area about 1798-1799 from Montgomery County, after purchasing a large tract of land from John Anderson. 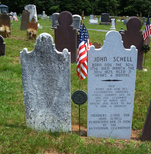 John Schell was a very generous man, donating land for the first church and later for schools in the small community. He laid out the town of Schellsburg in November of 1808, and by spring had sold ten lots. Some of those original homes still line the main street (Lincoln Highway-Route 30). The church is 25 X 30 feet; two stories high, galleries on three sides with a wine glass pulpit. The church was built of logs that were furnished by John Schell, John Mowry, Jacob Hillegass, and George Rock, each furnishing one side. For six years the congregation worshipped by sitting on logs. In 1809, a stove and pipe were purchased. It is said that previous to the stove purchase, members brought their dogs to church to keep their feet warm! In 1812, the pulpit, the stairs and the pews were erected and installed. Two years later the gallery was built; and several years later the church was plastered. At one time the outside of the church was weather boarded, but in 1935 the weatherboarding was removed and has since been known as the “Old Log Church.” It was noted in one source that $225.91 ½ cents was spent on the completion of the church. The Missionary Society of the Reformed Church contributed four dollars of this amount. Church membership at this time was 37. The first minister of the church was Rev. Deatrich Aurandt, probably in a missionary capacity. Another record indicates that Rev. Henry Gerhart became the first regular pastor in the fall of 1811. He served this church for the next seventeen years. Members of the Lutheran, Reformed, Methodist, and Presbyterian churches were named as corporators of the cemetery of which the governor approved the charter on March 17, 1860 for the formation of the Chestnut Ridge and Schellsburg Union Cemetery. The land for the cemetery was deeded in 1897. In 1806 the first burial took place (little Whetstone girl), and since that time has been used as a burial place for area residents. The cemetery association is still active with approximately 25 burials each year. The Centennial celebration for the church was held on Saturday, June 23, 1906. Accounts report that 3500 people took part in or witnessed the parade and addresses given by the Honorable William P. Schell and the Rev. B.H. Hunt. 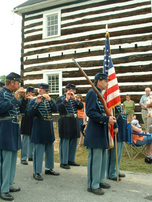 On June 26, 2002 the first organizational meeting of the Old Log Church and Cemetery Preservation Society met at the Old Log Church. The purpose of the meeting was to gain support for the restoration of the church and to have it ready for its bicentennial celebration in 2006. In addition to the restoration of the church, it was decided that the church should be placed on the National Register. Discussion included concern for the condition of the gravestones as well. During the summer of 2003, members of the Society began recording information on the gravestones. In September of 2003, Everett Marble and Granite Works, began repairing and resetting the most fragile of the gravestones. Also, in the fall of 2003 Society members waterproofed the oldest gravestones to protect them from the weather.